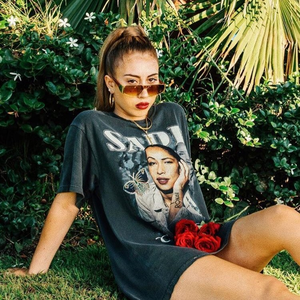 Karly Loaiza (born July 17, 1993), known professionally as Kali Uchis, is a Colombian-American singer-songwriter, record producer and music video director. She was born in Colombia and raised in Virginia, United States. Uchis would write and produce most of her own music. She began collaborating with rapper Snoop Dogg on the song "On Edge", from his 2014 mixtape That's My Work 3. In February 2015, she released her first studio project, which is her first EP, titled Por Vida.